The governor of Massachusetts is weighing in on the controversial James “Whitey” Bulger case. Gov. 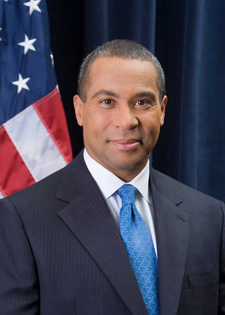 Deval Patrick said Thursday in an interview on WTKK-FM that more damaging information about the FBI could surface now that Bulger has been captured and is talking. Bulger was an informant for the FBI before he went on the lam in the mid-90s and one of his FBI handlers, agent John Connolly, is in prison after being convicted of assisting Bulger in a Florida murder. Connolly was supposedly on the take and there were allegations that other agents were as well. Patrick said he has spoken about the case with state troopers who served on the task force that hunted Bulger for years. “I feel like there’s this whole backstory I have to learn, but some of the stories are really chilling,” he said on WTKK-FM, according to the Boston Globe. Meanwhile, the New York Times quoted a former Boston FBI agent as saying there are people who might be worried Bulger may talk. “I think there are a whole bunch of people out there he could probably name” who are worried what he might say, said Robert Fitzpatrick, a former assistant special agent in charge of the Boston FBI office in the 1980s, the Times reported. Patrick had previously testified that he tried nsuccessfully to end Mr. Bulger’s run as an informant. The Times reported that during Bulger’s 16 years on the lam, several of his former crime partners testified that he had made payoffs to two dozen Boston police officers and half a dozen FBI agents, giving them thousands of dollars and rings, a Meerschaum pipe and Lalique glass. Posted: 7/1/11 at 9:49 AM under FBI, News Story.